All orders received before 4:00pm on working days (Monday – Friday, excluding bank holidays) will be dispatched the same day. Orders received after 4:00pm or on weekends and bank holidays will be dispatched the next working day. We will keep you informed every step of the way: you will receive a confirmation email when we receive your order followed by another one detailing the method of delivery and, if relevant, a tracking number once the order has been dispatched. We send you one more email one month after you ordered just to make sure you're happy with everything. We also promise to have the best prices around. Seen something at a cheaper price? Let us know and we'll match it AND give you 10% of the difference back. More information on our price guarantee can be found here. All mainland orders over €100 will be eligible for free standard shipping, no matter how large or bulky (excluding some remote and offshore postcodes). Please note; this is not a guaranteed service and the delivery times are estimates. The expected delivery times of this service is 2 - 4 working days from the date of dispatch but these are not guaranteed times. If your order is urgent, or you require it by a certain date, please use our Expedited Service which only costs €8.95. 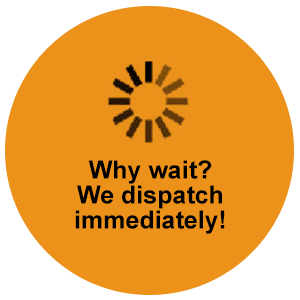 Orders placed on an expedited delivery service will be dispatched by courier and will be delivered within 2 working days from the date of dispatch. These deliveries will require a signature. Working days are defined by our couriers as Monday to Friday, excluding bank holidays (sorry - we know many of you work on the weekend but our couriers do not).